Holiday decorating just began here at home…how about yours? Our Ohio weather has spoken, and it’s forcing us to get our decorating done before the snow flies. As I assess my seasonal inventory, a DIY project or two almost always seems to break out. And who doesn’t love a knock off now and again? 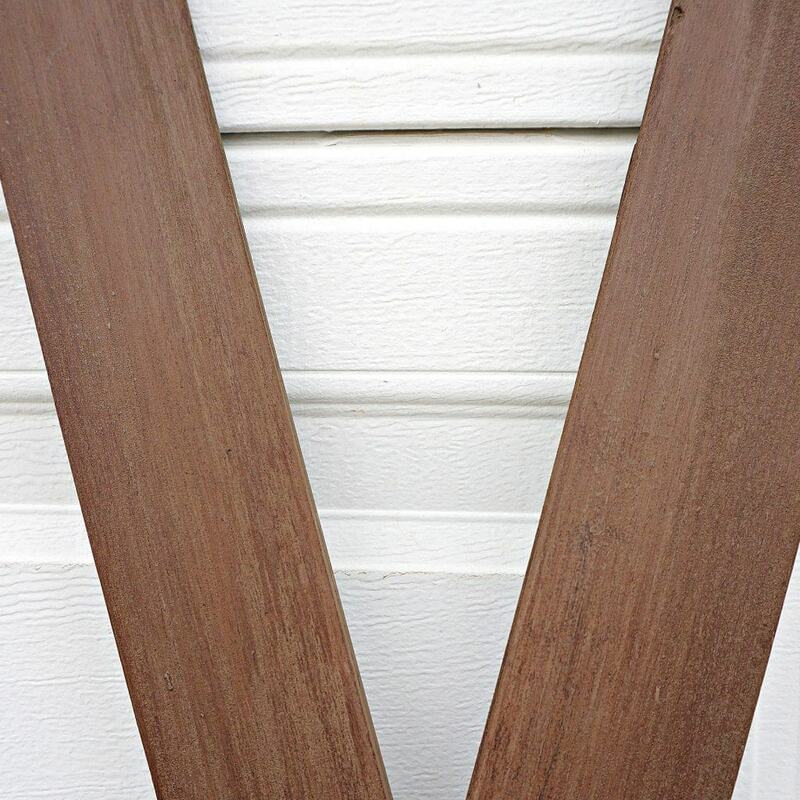 So today I’m sharing how I made these fiberglas skis look like old wood. Faux finishes are considered “in” again – did you know that? Aw come on, I’m sure you’ve been dying to sponge paint or marbleize your walls like we did in the 90’s, right? 😉 But if there is a chance I can make something look like real, vintage wood…it’s a shot worth taking. 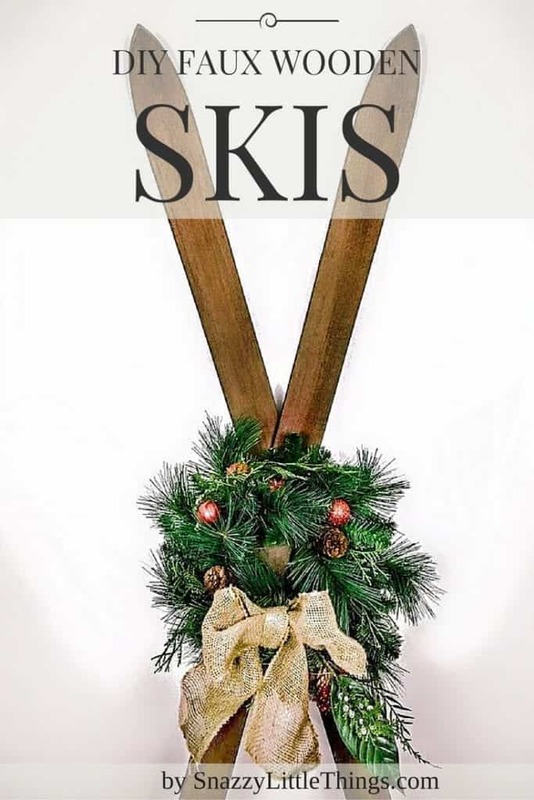 I was so sad to see that the Pottery Barn “Found” Skis were discontinued. Even though I love my PB, RH and IKEAs of the world, I prefer to find authentic antiques to display first. 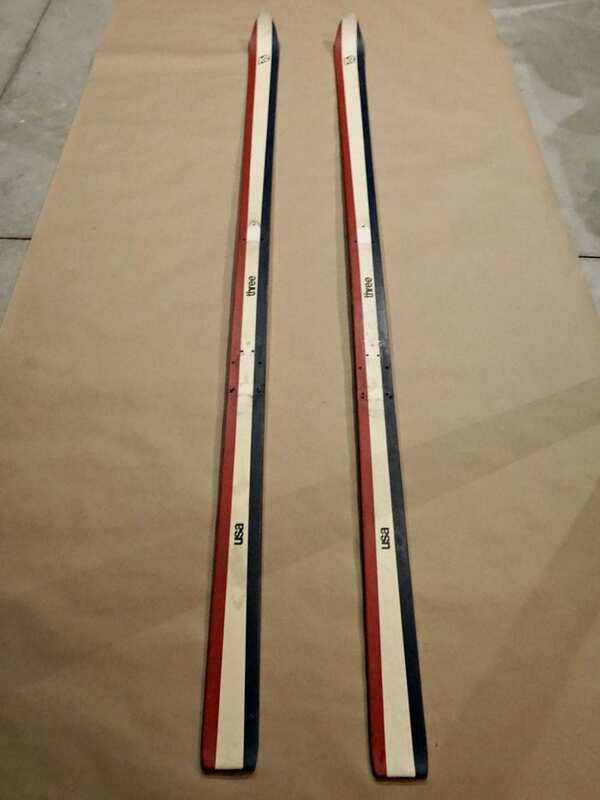 Since my search for real wooden skis came up short, these $30 fiberglass skis would have to suffice. Hopefully I can find the real thing soon, but this may have to hold me over. It was time to get resourceful. So I cleaned them with soap and water and let them dry. 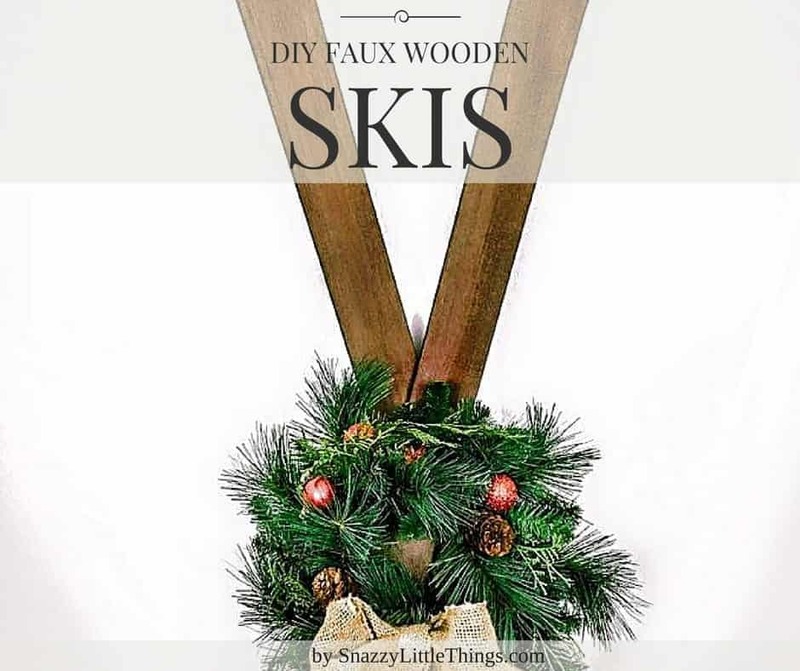 I applied two coats of Martha Stewart Chalk Paint in the color “Tilled Soil” to all sides of the skis — this is my “base” wood color. So for layer #2, I used an artists’ acrylic paint called “burnt umber”. It comes in a squeezable tube and you can find it in tubes in most any craft store (look in the artists’ acrylics department). It has a nice, rich warm tone to it. To see me doing this exact project, visit my Facebook page where I recorded a video of me working on these in our messy garage. I wasn’t totally prepared to shoot video and it was kind of a last minute decision, so I rambled a bit…but I plan to do more videos like this in the coming year. 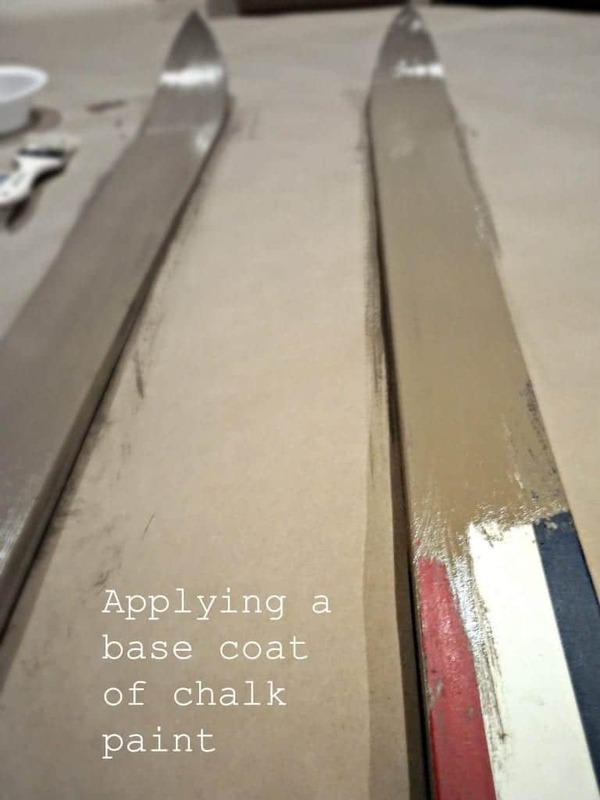 My “secret sauce” to create a faux wood finish is using a chip brush and alternating layers of two-to-four different (but complementary) paint colors. Dry brushing is a technique you’ll need to become comfortable with in order to create this effect. I could have added different paint colors to give it more depth and variation, but I loved what I was seeing, so I stopped. This is all a matter of taste and at your own discretion. In my case I tend to under-do things versus overdo. A quick spray of polyurethane to seal them, and they’re done. Apply a base coat representing the color “wood” you want. Choose approximately 2-4 varying shades of brown paint to dry brush layers onto your piece. Each time you dip your brush, test your dry brush technique on a piece of paper before allowing the brush to touch your piece. Do this every time! Water is unnecessary with dry brushing and could saturate your brush too much or change the consistency on your piece. Once you achieve the effect you want, stop!! Over-application may make the “wood” look too faux. 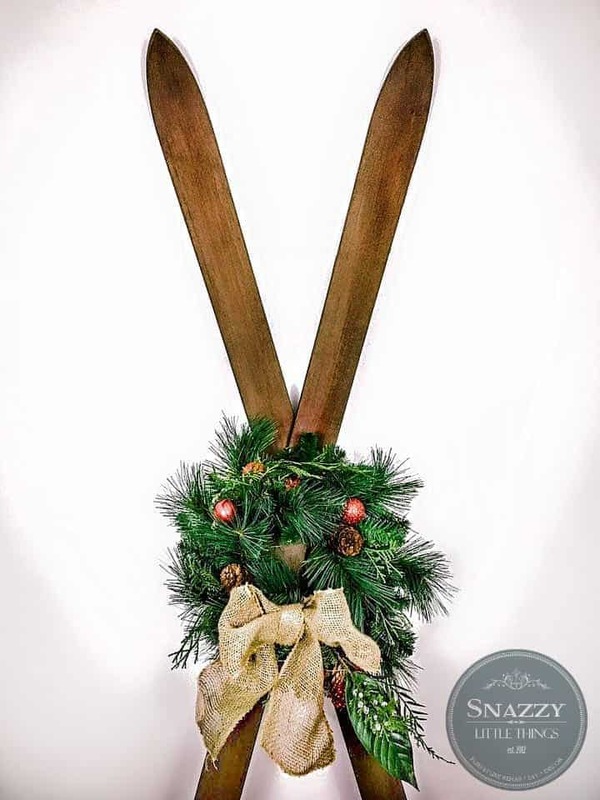 I put three screws in the back of the skis to secure them in a criss-cross position, then tied a wreath to the center. Makes for a perfect, but understated holiday display. Over the years we’ve found so many inexpensive ways to honor seasonal & holiday decorating since we’ve renovated our builders-grade home. This entire blog documents our DIY journey. If you’re not already receiving my emails, I invite you to become a subscriber where I offer free art printables, giveaways and weekly newsletter to keep readers up to date on my latest projects. 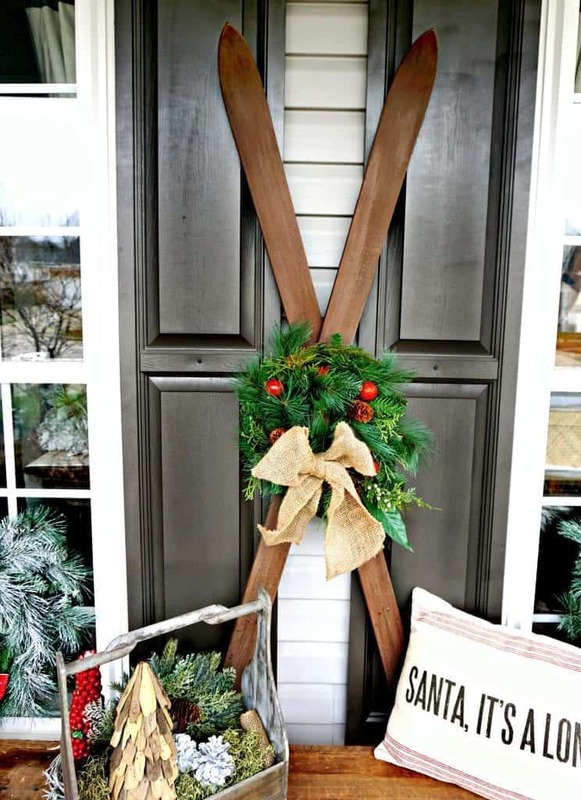 What a cute and creative way to create your own DIY Christmas decor! I love DIY projects, and I’m always looking for new ideas. Thanks for sharing!